YANGON, Myanmar–We flew from Bangkok to Yangon, Myanmar on Monday morning. Once there we were greeted by Twe Twe and Nang. They took us to lunch before visiting the Myanmar Engineering Society. We stopped at a local place, they let me sample the goat brains to see if I would like it as my main course. It seemed every meal we had during this trip was accompanied with mango, which was great for an avid fruit eater like myself. The mango I had today was sweet and had hints of mint in the flavor. After lunch we arrived at the University campus where the Myanmar Engineering Society (MES) is located. We had discussions with U Thang Mhint, the past President of MES and the current Myanmar Earthquake Committee chair, about current structural design practices in Myanmar, in order to gain a better idea of what current efforts are in place to implement a building code in Myanmar. 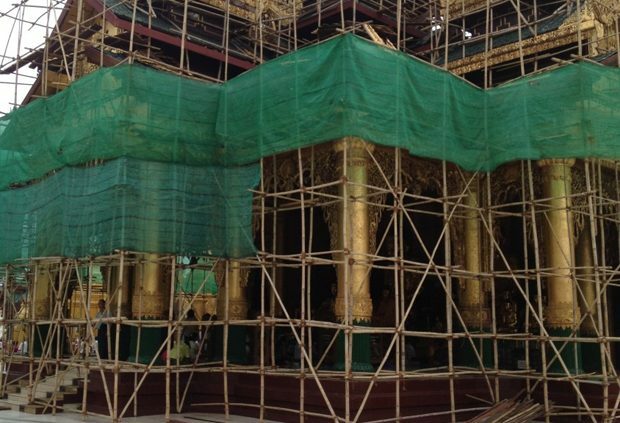 Although Myanmar is located in a seismically activearea of the world, currently the country has no building code. They are modeling the proposed code after the ASCE 7. 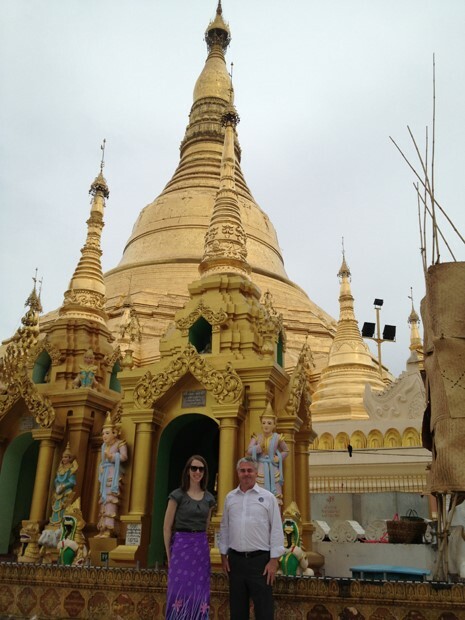 We ended the day with a visit to the Swedagon pagoda in the heart of Yangon. All those visiting must cover their legs and take off their shoes—hence the purple skirt in the picture. It is customary to walk clockwise around the pagoda twice for good merit. 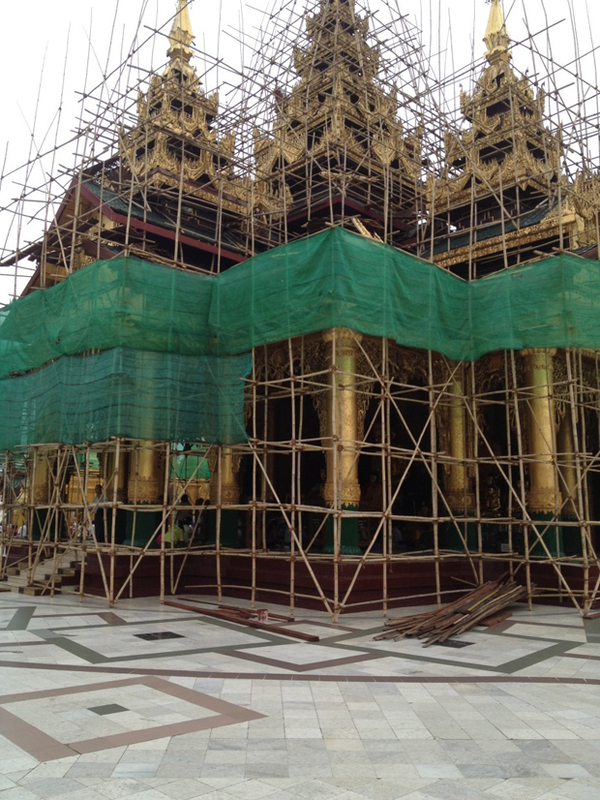 While we were there, they were cleaning part of the historic pagoda with the help of bamboo scaffolding, something I’ve heard about but never seen until now. The following day, we went on a ten hour round trip journey to Naipaydaw, the new capital of Myanmar. The road to get there is very scenic with beautiful rich green farm land, small pagodas and Buddhist temples scattered along the entire length of the drive. Upon arriving in Naypaidaw, we met with the director and deputies under the Ministry of Culture for the country of Myanmar. 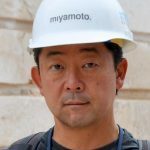 Miyamoto is working to gain an understanding of what action the Myanmar government is taking to retrofit and protect the country’s building heritage from future earthquakes. The following day we met with the Ministry of Irrigation and the Yangon Heritage Trust (YHT) to discuss heritage building retrofitting as well. 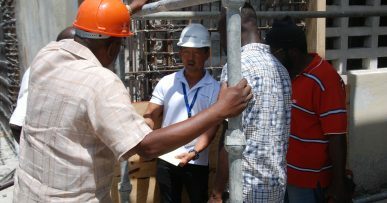 They mentioned the need to retrofit many of the British colonial structures as well as those built in the early 20th century. We learned during our visit that some of these beautiful historic structures, pagodas as well as British colonial buildings, have suffered extensive damage from previous earthquakes and there is a huge desire to retrofit and protect not just the structures but also what they represent: the heart and heritage of Myanmar. Elizabeth Kenyon, June 5, 2013.